The old newsletter that we used to put out called “Bartending…and Beyond!” has come here to be put to rest. If ever a bartending newsletter peeks its ugly head over the horizon, it will be called Beyond Bartending. Although the Bartending and Beyond newsletter isn’t being produced anymore, that doesn’t mean that we just threw away all the great bartending material in each of the Bartending and Beyond back issues. Hells No! 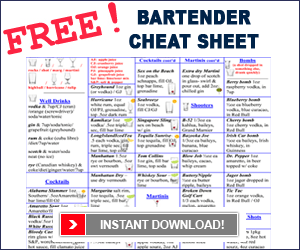 We’ve dissected each and every issue of Bartending…and Beyond! and created new pages with each piece of content that we put into the bartending newsletter. So if there was something that you remember seeing in one of our past bartending newsletters, simply check our Bartending Sitemap or click on the Bars and Bartending homepage and use the search function on the right hand side.